Size of folded digital notecards: 4.25" x 5.5". Your choice of ink color, typestyle & envelopes. These angelic note cards depict a whimsical green pine tree with an angel putting a star on top. Other colors in the card include white, red, green, orange, brown and black. 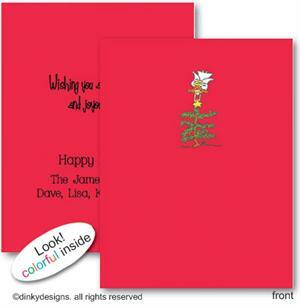 These note cards are perfect for holiday greeting cards, thank you notes, invitations or a simple holiday wish.